Welcoming Fall, I just can’t get enough comfort food! One of the most versatile, overlooked, economical vegetables grown is a head of cabbage. I can literally make four to five dishes with ONE head of cabbage…slaw, soup, egg rolls, stir fry, you name it. The first thing on the cabbage agenda is always removing the lush green outer leaves for Stuffed Cabbage Rolls. 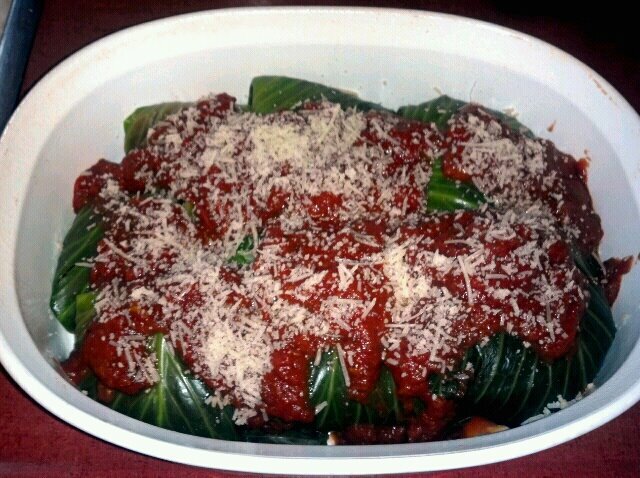 They are gorgeous with the savory bright red sauce and leafy green wrap, and so warm, filling and yummy. Cook outer cabbage leaves in boiling water for about 10 minutes or softened; drain. In a large saucepan, saute onion in butter until tender. Add the tomatoes, garlic, brown sugar and 1/2 teaspoon salt. Simmer for 15 minutes, stirring occasionally. In a large bowl, combine the rice, tomato sauce, Worcestershire sauce, pepper and salt. Add beef and sausage and mix well. Place about 1/2 cup meat mixture on each leaf; fold in sides. Starting at an unfolded edge, roll up leaf to completely enclose filling. Place seam side down in a skillet. Top with the sauce. Cover and cook over medium-low heat for 1 hour. Add V8 juice if desired. Reduce heat to low; cook 20 minutes longer or until rolls are heated through. Top with Parmesan Cheese if desired. I like easy y’all! Bon Appetit! Tip: For easier rolling, the center thick section of the outer leaves can be removed.